Western blot analysis of extracts from various cell lines using Ezh2 Antibody. Chromatin immunoprecipitations were performed with cross-linked chromatin from NCCIT cells and either EZH2 Antibody or Normal Rabbit IgG #2729 using SimpleChIP® Enzymatic Chromatin IP Kit (Magnetic Beads) #9003. The enriched DNA was quantified by real-time PCR using SimpleChIP® Human HoxA1 Intron 1 Primers #7707, SimpleChIP® Human HoxA2 Promoter Primers #5517 and SimpleChIP® Human α Satellite Repeat Primers #4486. The amount of immunoprecipitated DNA in each sample is represented as signal relative to the total amount of input chromatin, which is equivalent to one. 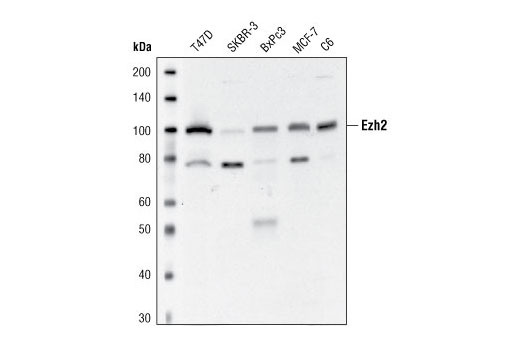 Ezh2 Antibody detects endogenous levels of Ezh2 protein. 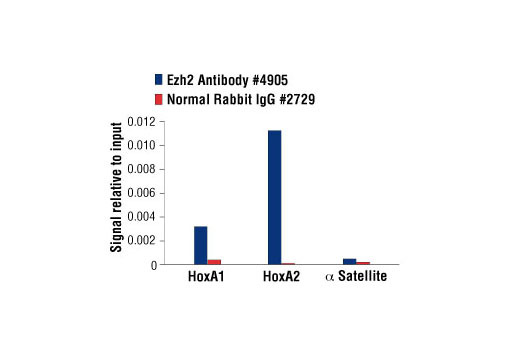 The antibody may cross-react with Ezh2-related proteins. Polyclonal antibodies are produced by immunizing animals with a synthetic peptide corresponding to residues surrounding Arg354 of human Ezh2 protein. Antibodies are purified by protein A and peptide affinity chromatography. The polycomb group (PcG) proteins are involved in maintaining the silenced state of several developmentally regulated genes and contribute to the maintenance of cell identity, cell cycle regulation, and oncogenesis (1,2). Enhancer of zeste homolog 2 (Ezh2), a member of this large protein family, contains four conserved regions including domain I, domain II, and a cysteine-rich amino acid stretch that precedes the carboxy-terminal SET domain (3). The SET domain has been linked with histone methyltransferase (HMTase) activity. Moreover, mammalian Ezh2 is a member of a histone deacetylase complex that functions in gene silencing, acting at the level of chromatin structure (4). Ezh2 complexes methylate histone H3 at Lys9 and 27 in vitro, which is thought to be involved in targeting transcriptional regulators to specific loci (5). Ezh2 is deregulated in various tumor types, and its role, both as a primary effector and as a mediator of tumorigenesis, has become a subject of increased interest (6). Sellers, W.R. and Loda, M. (2002) Cancer Cell 2, 349-50. Visser, H.P. et al. (2001) Br J Haematol 112, 950-8. Chen, H. et al. (1996) Genomics 38, 30-7. Tonini, T. et al. (2004) Oncogene 23, 4930-7. Kleer, C.G. et al. (2003) Proc Natl Acad Sci U S A 100, 11606-11.